The prosperous Var department is located in the most extreme south-easterly point in France and has an unsurpassable climate, except in early spring when the heavy showers arrive. Toulon - where the English are once again welcome! Toulon is the departmental capital of the Var with a population of over 160,000. It has the biggest harbour in mainland Europe. France's Mediterranean navy fleet use the city as its base. Toulon is a historic centre in many ways, and its attractive old streets are host to many ancient buildings and hidden historic corners. The town also has a lively cultural scene, the highlight of which is the fantastic local opera company. 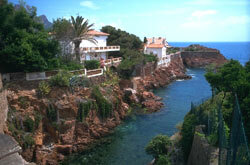 The hills that look over the town and onto the sea have a number of great properties. The city received substantial damage during the Second World War giving the centre a very different atmosphere to its neighbours on the coastline. It was here that a young man by the name of Napoleon Bonaparte rose to fame during a siege in which the English were expelled. To the east of the Var you'll find the town of Hyeres, which is a great blend of both Provence and Cote d'Azur culture. There are few other places that offer exotic palm trees on a sun-soaked coast together with a medieval old town and other historical interests. 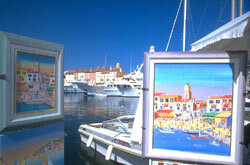 Further up the coastline you'll come across St-Tropez, dubbed "St. Trop" (meaning "too much"!) This is certainly a stunning town architecturally and is celebrated for its glamorous lifestyle. It has a population of just 6000 in the low season, but as the temperature increases for the summer months so does the number of people residing here. Keep heading up the coastline and you'll come across the tourist resorts of Frejus and St-Raphael with their stretching sandy beaches and Roman remains. Not to be missed is Port-Grimaud. Built along a network of canals, the city bears a striking resemblance to the Italian city of Venice. The city is very attractive, although the top prize goes to Bargeme, which is widely acknowledged as one of the prettiest villages in the whole of France. Another close runner-up is Mont Saint-Victoire, which has the honour of being the subject of one of Cezanne's paintings. In the area you'll also find the Gorges du Verdon, Europe's deepest canyon. The locals know it as the Grand Canyon du Verdon. Toulon airport currently operates direct flights to/from the UK, though should you want to get to the east of the department, Nice airport might be a better option. If you'd rather avoid flying, however, you could take a Rail Europe service from the UK all the way to Toulon. Do you know Var better than we do? Do you have photos of Var? Var is located in the south of Provence Alpes-Cote d'Azur.